Probiotics help make this formula easy to digest and aid in immunity. Balanced nutrition for large breed dogs. Provides L-Carnitine and glucosamine for joint and hip support. Affordable choice for large breed dogs and those with more than one large dog to feed. Fish provides a source of oils that can help with skin and coat. Great blend of protein from chicken, turkey, duck, and fish. It’s great when dog foods don’t just include a bunch of meat and cheaper grains. This food has fruits and vegetables in it so your dog gets a good balance. Dogs really like a lot of the foods we eat but that gets overlooked a lot of the time because it costs more to make. Fruits and veggies are valuable sources of antioxidants for your dog. 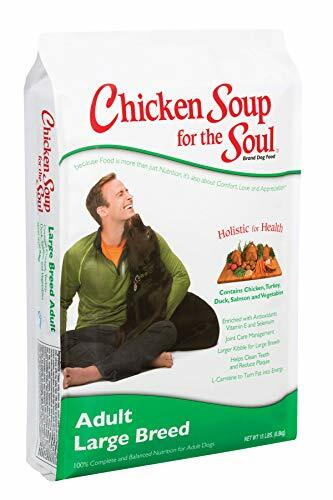 Over 7 days gradually replace your dog’s current food with Chicken Soup for the Soul brand. If your dog is very sensitive to food changes you can increase the transition period to up to 14 days. Ask your vet for food advice if your dog has any pre-existing conditions. Always have fresh water available near where your dog is going to eat. The feeding amounts listed above are just guidelines.and may need to be adjusted to suit your dog’s activity level and age. Large dogs may be better off if their food is split into two feedings per day. Chicken Soup For The Soul Large Breed Adult Dog Food is a good choice for budget conscious parents of big dogs. The easy to digest formula provides a great variety of proteins and while it contains grains, it does not have corn, wheat, or soy. The Chicken Soup brand is great about leaving out artificial colors and flavors.